In nature too we can see this or Let’s take a country.A country always tries to clear the central problems and then turn attention to the state problems.The damage to the center is always cleared before looking into the problems of the state. Let me say another example if a burglar attacks you, wouldn’t you give him what you have got in turn for your life. Yes indeed. Everyone tries to preserve the most important of the lot. The body also does the same. The living body always tries to bring on disease to a local part, say the skin, in turn for the disease in a more important organ. The child may have eczema, a skin disease instead of a asthmatic attack. The living body can do that. It can show the symptom on another plane(organ). YES, imagine this is real. When you try to remove the skin problem by ointments, these are gone!, where? Yes to the lungs or some other internal organs. The eczema is the external manifestation of the more important disease (say here the asthma). NEVER EVER TRY TO REMOVE THE SKIN DISEASE BY OINTMENTS. The so called diseases that have crippled mankind are always a product of suppressed minor diseases. Recently, I had a patient who just came to me and asked for checking the blood pressure and said “I was in the ICU for the last two weeks due to kidney failure”. I asked the reason and he said that, he had a peculiar rare infection (inflammation) of the kidney (nephritis) and his body was swollen with edema. The doctor’s were unable to identify the cause of the disease. But with little bit of luck (as the doctor said) he was able to overcome the disease. So what was the luck? (that the doctor didn't know) I just interrogated, that was the return of the skin disease, which he had suppressed by a powerful ointment a month ago. This skin eruption was there on his leg for the last few years. These are some of the symptoms in synthesis repertory. There are many more cases to illustrate. (suppressed skin disease causing heart problems, gastric ulcers, rheumatic problems and even insanity in one case.). So dear friends , say goodbye to ointments, which can cripple your healthy long life . Thanks for sharing benefical infrormation. 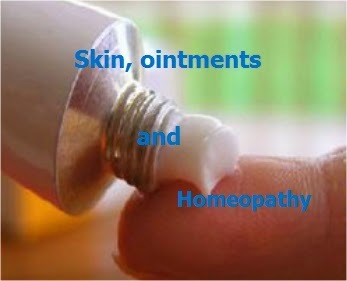 Today homeopathic skin treatment is best technique for skin. I think there are not any side effect of homeopathic treatment.